★【FUNCTION MORE WIDELY】:You can use this to brush pot, plate, bowl can also be used to wash fruit, vegetables. Even you can use it for shower.As the insulation pad more features waiting for you to find. 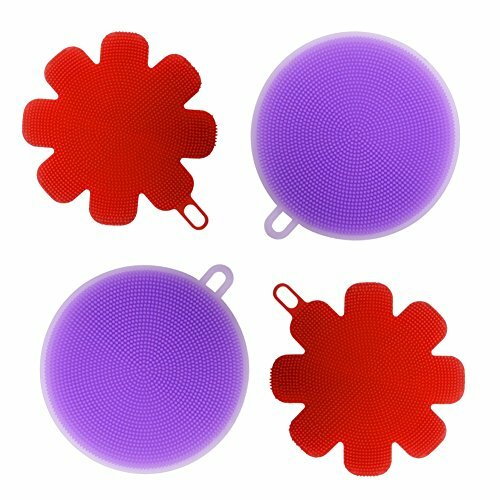 ★【TWO DIFFERENT FUNCTIONS】:Purple, double-sided silicone brush.Red, double-sided different functions.Brush side: Silicone scrubbers with thick and soft bristles, Easy to clean up utensils. The other side: Heat insulation mat design, more convenient. ★【EASIER TO CLEAN】: Need to clean only when you need to boil in boiling water, sterilization more secure, prevent the growing of bacteria cleaner than the traditional sponge.Protect the health of you and your family. ★【100% MONEY BACK GUARANTEE】 : If you don\'t like your product, or whatever, we\'ll instantly refund your money in full. It\'s our promise and we don\'t lie. Don\'t miss!